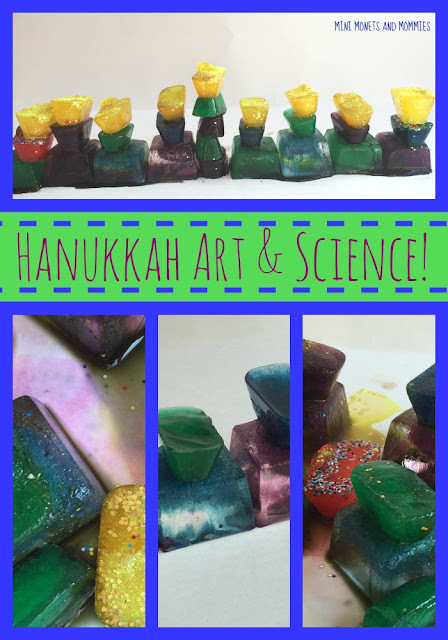 Mini Monets and Mommies: Hanukkah Melting Menorah: Science and Art for Kids! Hanukkah Melting Menorah: Science and Art for Kids! Celebrating Hanukkah in my house hasn’t always been ‘traditional’. I’m Jewish, and my husband is not. That means our son gets eight nights of presents, plus Christmas. It also means educating him about both holidays. That said, adding in some artsy fun is always welcome when it comes to teaching. Ok, so my son has never been in love with art (of course, because I am an arts educator—sarcasm very much implied here). So, I’ve always tried adding another type of activity in with the art. This menorah art exploration also includes science as well. 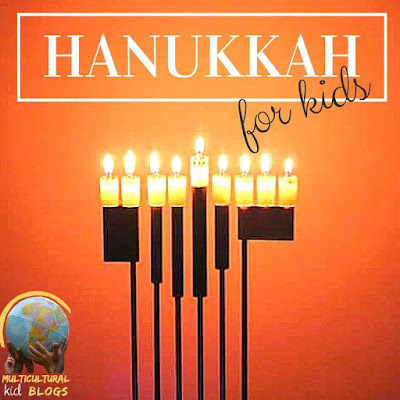 It’s also part of the Multicultural Kid Blogs Hanukkah for Kids series! I’m a fan of coloring ice cubes and letting them melt into swirling, whirling water colors. 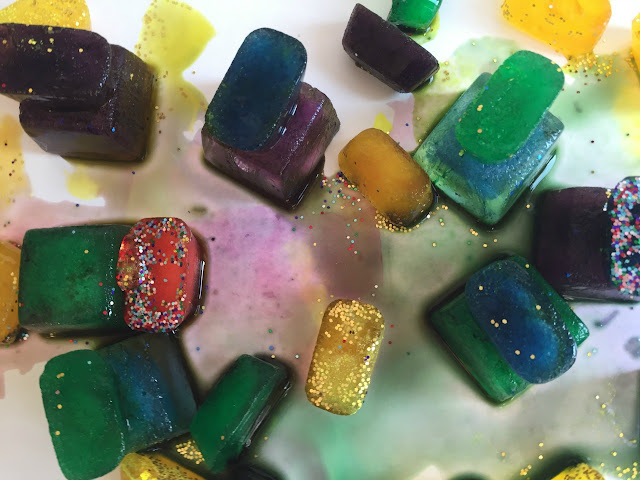 Not only does the melting ice teach your child about the solid-to-liquid transformation, but it also adds in a lesson on color mixing. If you’re beginning to ask, “What does this have to do with Hanukkah?” – here it is. You can’t let your child play with the real menorah. Lit candles and a kid just don’t mix. With that in mind, you can make a crafty menorah. You and your child can also try this melting ice science/art menorah. 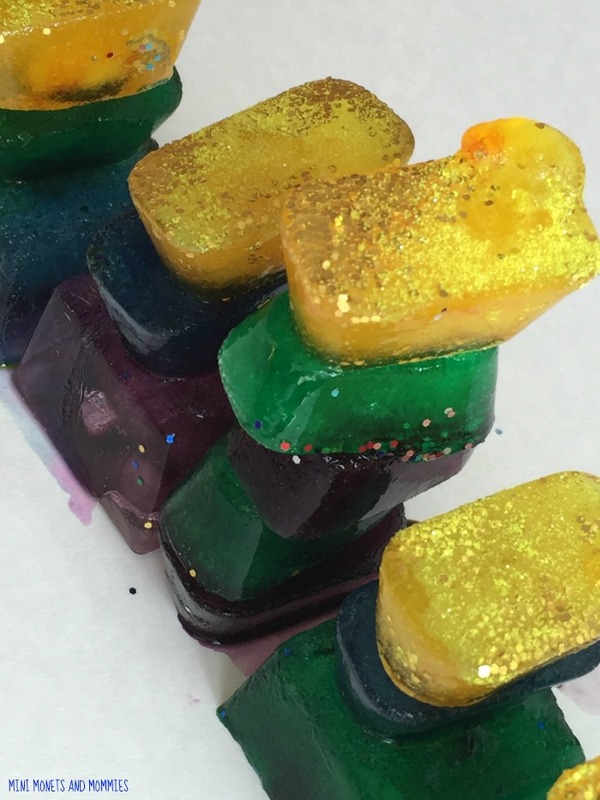 Unlike the slowly burning flames of the menorah’s candle, these melting ‘candles’ won’t burn anyone or anything. Before you begin, ask your child what he thinks will happen to his ice block menorah if he leaves it out. Dig a bit deeper and ask him to predict what it will eventually turn into (also ask how long he thinks it will take to melt). 1. Make the ice for the menorah. You need enough to make a base and ‘candle holders’. Keep in mind you need eight holders (one for each night of Hanukkah) and a center shamash candle. The shamash is the ‘attendant’ candle – the one that you use to light the others. Drip a few drops of food coloring into each compartment of the trays (sprinkle in some glitter too, if your child wants). Pour in water. Freeze. 2. Drip a few drops of yellow food coloring into another tray. You need at least none pieces to make nine flames. 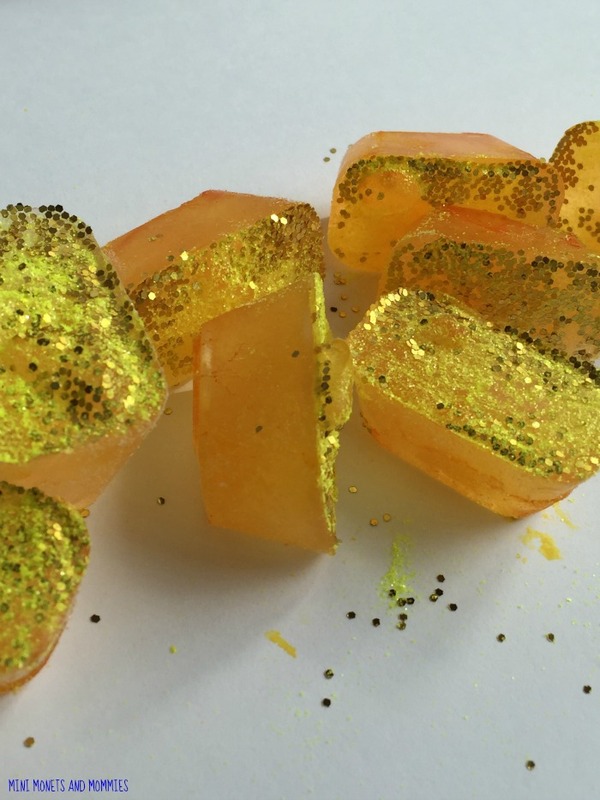 Sprinkle gold glitter on top to make sparkling flames. Freeze the flame cubes. 3. Pop the frozen cubes out of the freezer. 4. 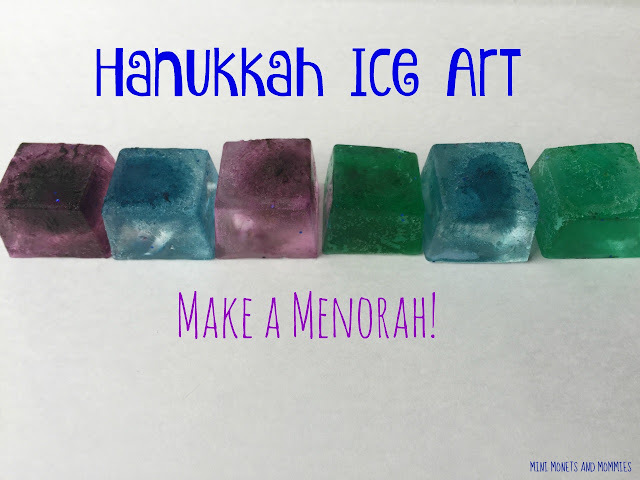 Stack the ice in the shape of a menorah on thick card stock paper. Encourage your child to explore and experiment with the engineering aspect of it. Let him stack the cubes in any way that he wants, making sure to count out the nine total candle holders. He can also make the center shamash holder taller than the other. 5. Add the ‘flames’. Stack the yellow and gold glitter cubes on top of the candles. As the ice begins to melt your child can start spreading the flowing water colors around. By moving the different colors of ice he can discover what happens when the colors mix. Eventually the menorah will melt. But, it won’t be gone. Save the remaining water color paint paper as a reminder of this Hanukkah activity. Are you looking for more art and science activities? 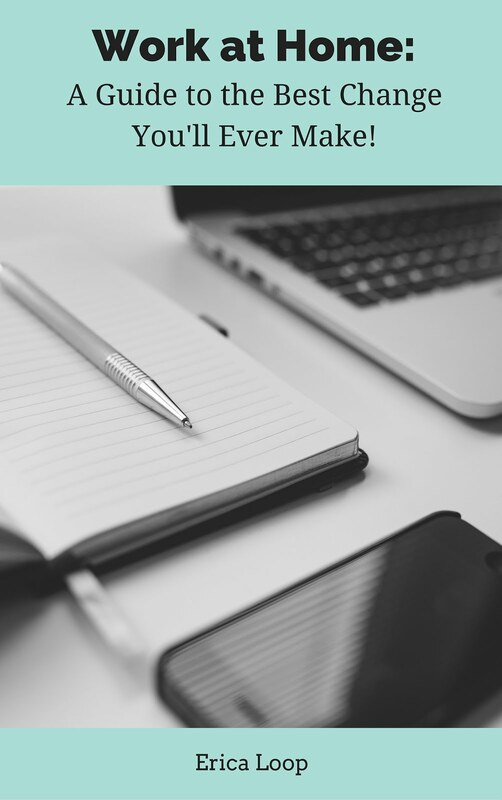 Follow my Pinterest board for more ideas!